Report of H.L. 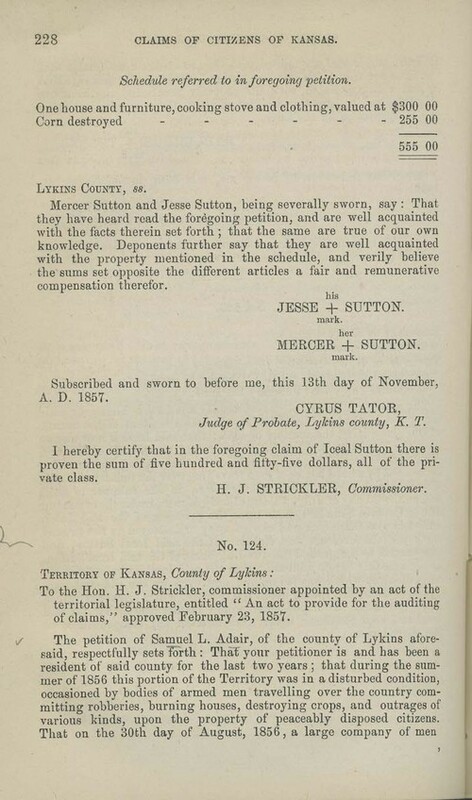 Strickler, Commissioner to Audit Claims of Citizens of the Territory of Kansas, contained in the U.S. Congressional Serial Set of congressional and executive documents. Samuel Adair of Osawatomie submitted claim # 124 for one heifer for himself and for a yoke of cattle on behalf of Rachel Gunison [Garrison]. The animals were taken by men under the command of John W. Reid on August 30, 1856. Adair lived near Osawatomie. Each claimant had to submit an itemized list and have two witnesses attest to the losses claimed. Even though many of these claims were approved for payment, no funds were ever appropriated or distributed.